As I and 2 of my best mates all turn 30 this year (last week for me in fact) we decided to do something other than get drunk to mark the occasion. So 2 days ago me, Chris and Vas walked up to the top of Snowdon, in North West Wales. The night before we camped nearby at Llyn Gwynant. It was hammering down with rain that evening and during the night, so although the campsite was nice, right by lake, if it wasn’t for the rain it would have been fun to explore, though alas we were stuck in our tent. The next day the weather was much more pleasant, it was a bit grey in the morning but the sun was shining by the afternoon. Excellent walking weather. We started just before 9am and we took the ‘Pyg track’ to travel up and the ‘Miners Path’ to come back down. It’s a well walked track, there were plenty of other people embarking on it. The views are beautiful, the surrounding countryside, mountains and lakes making it well worth the walk. We took around 7 hours in total, with a few stops for pictures and food and spending some time at the top as well. It’s kind of bizarre that there is a cafe at the top with a train line that goes up there! All in all it was a really fun experience, something i’ve always wanted to do and glad to say i’ve finally done it! View from the top of Snowdon. 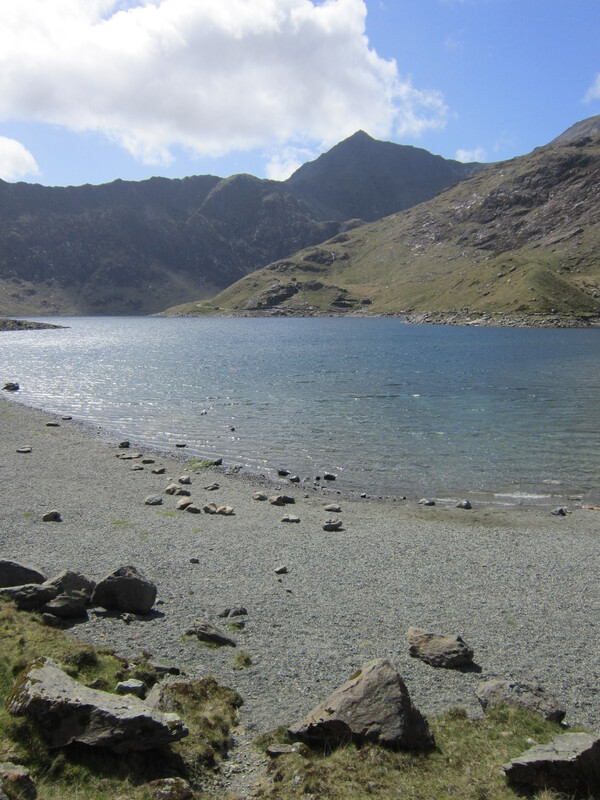 The lake is Llyn Llydaw.